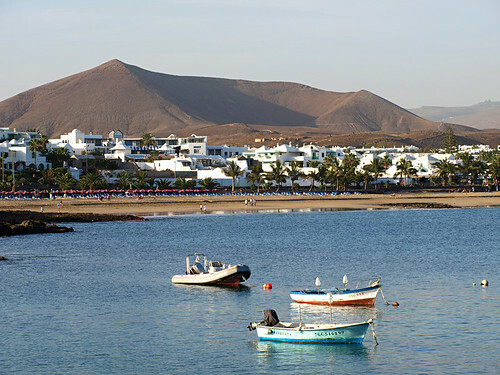 Although developed as a tourist resort, Costa Teguise on Lanzarote’s south east coast has a pleasing small town community feel to it, possibly as a result of two factors. 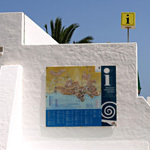 The César Manrique styled Pueblo Marinero in the centre of the resort with its whitewashed, low-rise buildings and their typical spring-green woodwork looks more like a traditional Lanzarote town than a resort. The other factor is that Costa Teguise is a magnet for sports-people. Being on the breezy east coast it’s a haven for windsurfers whose presence add a laid back vibe to the place and probably accounts for the health food shops as well as some bars and restaurants that exude a bit more stylish panache than those of the average sun-kissed holiday resort. Apart from surfers, Costa Teguise’ long flat promenade and proximity to quiet country tracks attracts cyclists and runners from across Europe, drawn by a climate that is perfect for year round training. 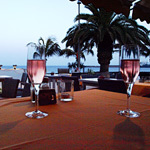 Costa Teguise is a resort with two personalities. In one part are the typical resort bars and restaurants aimed at mainly British tourists, whereas the other face of Costa Teguise has a slightly bohemian, sporty character with bars, restaurants and activities that should appeal to visitors looking for something a little bit different. The resort is also the location of La Mareta, a royal residence originally built for King Hussein I of Jordan but now used by the Spanish Royal Family and visiting dignitaries. The influence of César Manrique is clear in the network of narrow streets that make up the Pueblo Marinero. 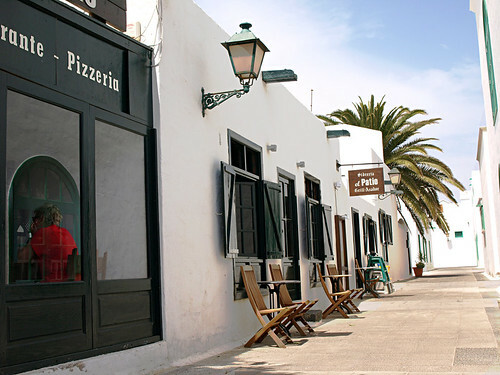 As well as bars, restaurants and shops, the Pueblo Marinero is the heart of Costa Teguise and the location for fiestas, fairs, markets and all sorts of shindigs. When none of these are taking place it’s just a damn nice place for a stroll and you’re never too far from an enticing tapas bar or sinful pastelaría. When all’s said and done and at the end of the day and all that, Costa Teguise is a beach resort. And a good beach resort needs pretty stunning beaches. 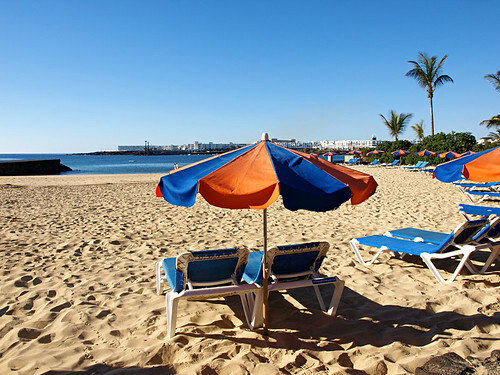 Costa Teguise has six pale, golden sand goodies to chose from – El Ancla; Bastián, El Jabillo (good for diving lessons), Las Cucharas (a mix of traditional resort beach and the haunt for windsurfing dudes); Las Salinas and Playa de las Charcos which, being at the northern end of town, tends to be crowd free most of the year. The town has a golf course, aquarium and water park but then doesn’t just about every resort? Better to enjoy what natural offerings are at hand. If you’re energetic like quite a few visitors, then a run northwards will take you to empty dirt trails that skirt the coast and past blindingly white lone houses (sunglasses essential) and small villages. An alternative way is to explore the coastal tracks by bike… or you could simply walk. Squeezing into a diving suit and slipping into the refreshing waters lapping El Jabillo beach is something that really rings my bell. There’s something extremely Bond-ish about scuba diving and after an intense briefing by Calipso Diving you can be mixing it up with schools of tropical fish and even the odd sand shark in beautifully clear blue waters whilst the theme to Thunderball provides a soundtrack only you can hear. 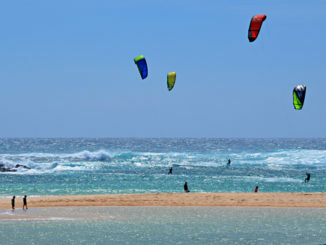 As the location for various windsurfing competitions including the PWA World Windsurfing Championship in the past, lovers of board sports are spoiled in Costa Teguise. There are plenty of surf schools so that novices can get in on the act as well. The summer trade winds make April to September the best months for riding the waves. A brilliant new sport for anyone who hasn’t tried any board sports before. Basically you get on a surf board, stand up and paddle. There’s no nonsense about waiting for a decent wave and thrashing your arms like a loon before you can get to travel anywhere on your board. Chris Diaz at SUP Lanzarote is a cool guy with an appreciation of nature and a passion for helping newbies get to grips with the sport as quickly and as safely as possible. It’s great fun and one of his routes is called SUP & Tapas – that’s my kind of sport. Casa Felix behind Playa Bastián is more of a traditional restaurant run by the personable Felix who has picked up various tapas ideas from his travels on other Canary Islands including Tenerife. Good home-cooked Canarian tapas like deep fried cheese, churros de pescado and more-ish fried sweet potato slices make Casa Felix an excellent spot for a bit of post sunbathing lunch. 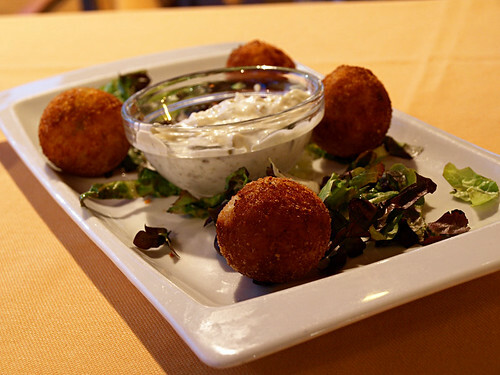 Restaurants in Costa Teguise cook up a mix of many influences including the Basque Country. 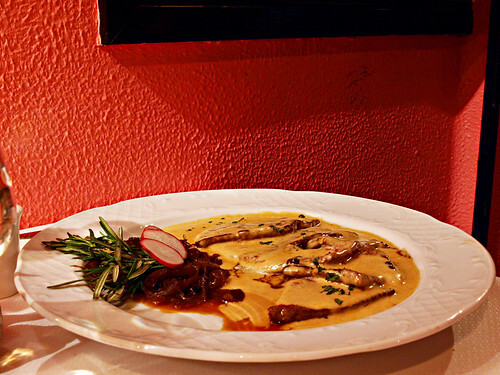 La Pikada is one of those great little bars with a northern Spain earthiness. With around 30 Basque influenced tapas dishes and bottled cider to round off the Basque culinary experience you’ll be supporting Athletic Club Bilbao before you’ve finished scoffing one of their stuffed roasted peppers. Part deli, part bakery and part coffee shop, BrowN is simply a nice place to hang out that serves appetising home cooking. Part of its appeal is that veggies haven’t been overlooked when the menu was created, so it’s ideal for mixed lunch company. It’s also good for people who like the occasional pastry hit as well as those who like their salads to have a personality. BrowN does yummy take away hummus, lentil, Waldorf and lemon & coriander salads that are perfect picnic fodder for an exploration of Lanzarote. As a resort, Costa Teguise obviously has a decent choice of bars although many are aimed at a mainstream British tourist market (i.e. karaoke, sports bars, Irish pubs etc.). As a general rule, the bars nearest to the harbour area fall into that category. From the main Pueblo Marinero area heading north there are other bars which might suit visitors wanting something different like Jazz Mi Madre, which gets going after 10pm, or cosy bars that have a more Spanish feel. For late birds, there are a couple of clubs near the centre of Pueblo Marinero that stay open till around 6am. Best times for anyone looking for a lively local scene are when there’s a fiesta or open air concert (again around the Pueblo Marinero area). 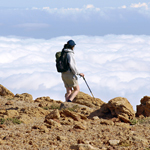 Costa Teguise is a smallish resort so walking everywhere isn’t a problem. However, driving anywhere on Lanzarote is a joy (long quiet roads) so it’s a crime not to get out and about. We explored Lanzarote with a Citroen C3 from Feycan which was easy to drive and seemed very well suited to the roads and the terrain; the petrol gauge hardly moved a millimetre from one end of the island to the next. An alternative and quite chic way to get around over relatively short distances and for exploring towns is by way of a scooter. Blue Speed dropped off a rather nifty looking brand new machine at our hotel and we headed into the hills with songs from Quadrophenia going around and around our heads. A bonus, apart from looking quite cool, is that scooters are great for negotiating narrow streets like those in the former capital of Teguise plus finding a parking space really isn’t a problem. They’re also a fun way to get around. 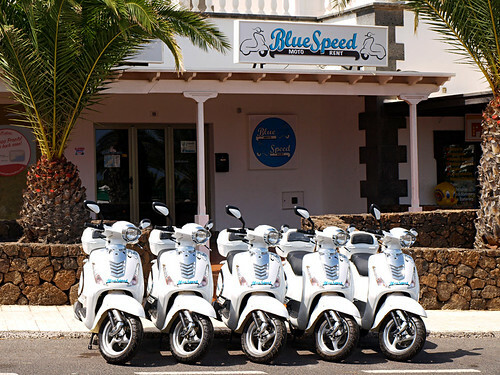 Buzz Trips visited Costa Teguise as a guest of Turismo Teguise and Sands Beach Resort. However, as always, the views and opinions are 100% our own. And one of the best parts about Lanzarote is the solitude you can feel right outside the towns. Love your pic of the lava fields. Amazing they can grow grapes there!